Professor Philip Spencer is Director of the Helen Bamber Centre for the Study of Rights, Conflict and Mass Violence, at Kingston University. The Centre, which he founded in 2004, provides a focus for research and teaching in these areas. His own research interests include the Holocaust, comparative genocide, nationalism, and antisemitism. He is also Director of the University’s European Research Department. 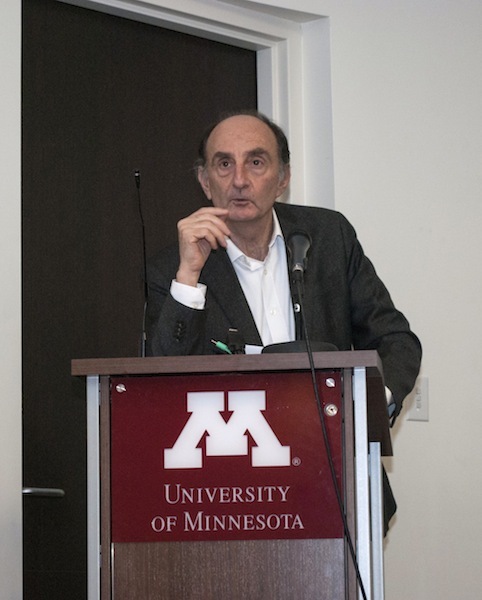 Professor Spencer was a panelist at the CHGS and the Center for Austrian Studies’ discussion on “Antisemitism Then and Now” and gave a lecture on “The Recurrence of Genocide Since the Holocaust”, both of which took place at the University of Minnesota December 5 & 6, 2013. Is there a necessary divide between Holocaust Studies and Genocide Studies? The field generally was dominated by the study of the Holocaust; that is the genocide about which we know the most. There are complicated reasons why this is the case, but there is massive literature about the Holocaust, which significantly outnumbers literature about any other genocide. Historically, the study of genocide emerged out of Holocaust Studies, and scholars or survivors of the Holocaust became interested in genocide more generally. Some people argue that the Holocaust distorts our understanding about other genocides because it is not a typical case. So one answer was to set up an alternative to Holocaust Studies: Genocide Studies, which is actually challenging the place of the Holocaust, sometimes with a polemical edge, especially in North America. So then you argue we need to move beyond this unhealthy competition, which is a kind of competitive victimology, which is not sensible or right. One should not compare suffering. It´s not about suffering, it is about the nature of a conscious genocidal project. It has a distinctive specificity because of the particularity of the project; Antisemitism as ideology is an important factor. We need to understand that both Holocaust and Genocide Studies have a place. But we need to do this by rethinking the place of the Holocaust in the history of genocide. Genocide is both intent and outcome, and the Holocaust is part of the history, it was preceded and followed by genocides. The most influential way of thinking about this now is that we shouldn´t privilege one over the other and we need to think in a more sophisticated way about structure and intent. That view would lead you to thinking that we don´t need to privilege the Holocaust, that we shouldn´t have something called Holocaust and Genocide Studies. My approach is to say, yes, there are important ways of which to say the Holocaust was part of a bigger genocidal story, but the Holocaust also has particular features, which make it a central event in the history of genocide. Convention would have been possible without the Holocaust. The Holocaust provided the language and the law to talk about genocide. How and when should there be intervention? I try to distinguish the elements necessary for genocide to take place. If you had the intent, the desire, and the fantasy to commit genocide, what would be possible to carry it out? But what I am most interested in are motives and the motivation of states and their populations to intervene and when they are reluctant to become involved. The question of how and when intervention should take place had to be reconsidered at the end of the 1990s, after Rwanda and Yugoslavia. We are reasonably clear now, with what authority the interventions should take place, but we are less clear on the timing. We can take the research on likelihood and proportion, but we do not know about political will. How do people move from being bystanders to rescuers? There is quite limited literature on rescuers, especially compared to a lot of literature on perpetrators. Most of it is indeed psychological, about distinguished moral virtues of helpers, their feeling that they just had to help. But I think it is also important to note that people are not always heroes from day one to the end. Rather, people can move around, become one and the other at different times of a genocide. What is interesting is the research about the political aspect of what makes people more likely to help others, like resources, capacities and pressures. The question of under what circumstances could people become rescuers raises a valuable contribution to stopping genocides.